The Battle of Cedar Creek on October 19, 1864, is famous as the battle that Major General Phillip Sheridan dashed twenty miles on horseback to reach, arriving just in time to rally his faltering troops and win the day. The episode became an instant legend. Months after the battle, artist Thomas Buchanan Read had celebrated it in both poetry and painting. Other paintings of “Sheridan’s Ride” would follow, and not all of them were to Sheridan’s liking. Trego’s portrayal of Sheridan at Winchester, Virginia, would have pleased the general, however. It concentrates not on the famous ride to the battle, but on the victory that resulted from Sheridan’s efforts, and on his vigorous pursuit of Confederate troops who were astonished by the Union’s sudden turnaround and counterattack. Perhaps taking a cue from Read’s popular poem, which described the general’s horse as flecked with foam, Trego clearly shows the horse’s foaming mouth and trails of foam down its chest and shoulder. The painting’s first owner, Jerome Byron Wheeler, had been at Cedar Creek with Sheridan as a member of the New York Sixth Cavalry. The Pursuit was the first work Trego painted in North Wales, the town that would be his home for the rest of his life. A pen and ink preparatory sketch for the work survives in a private collection. Purchased from the artist by Jerome B. Wheeler. On 8 March 1910 it was sold by the Anderson Auction Company in New York, lot 62, to E. N. Rose for $290. (“List of Auction Sales,” American Art Directory, vol. 8 [New York, 1911], p. 382). It was sold 19 March 1920 at the American Art Association auction in New York, lot 193, to Dr. John Loughlin for $200 (“Paintings Sold at Auction” American Art Annual, vol. 17, [Washington, DC: American Federation of Arts, 1920]. p. 333). The current owner inherited the painting from the brother of Dr. Loughlin. New York, 1885: American Art Association. Chicago, 1893: World’s Columbian Exposition, Gallery 37, #982, loaned by J. B. Wheeler. Washington, DC, 1993: National Museum of American Art and National Portrait Gallery. Famous Painting of the World, (New York: Bryan, Taylor & Company, 1894); The Worlds Greatest Paintings. Art and Artists of All Nations; over 400 photographic reproductions of great paintings with critical descriptions (New York: Arkell Weekly Co., 1895); Art Lovers Weekly 8, (1900); Charles McIllvane, The Pennsylvania Academy of the Fine Arts, Quarterly Illustrator for 1894, (New York: Harry C. Jones); Revisiting the White City: American Art at the 1893 Worlds Fair (Washington, DC: National Museum of American Art and National Portrait Gallery, Smithsonian Institution,1993). 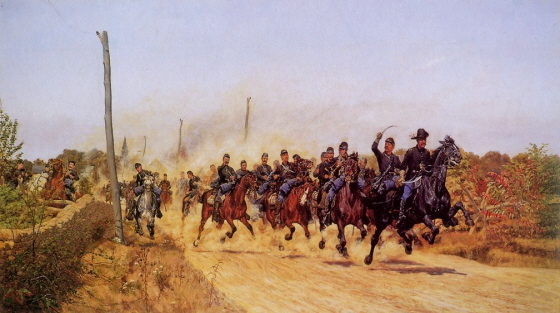 A litho print of the painting was published in History of the Eighteenth Regiment of Cavalry, Pennsylvania Volunteers 1862-1865 (New York: Publication Committee of the Regimental Association, 1909) opposite p. 112. In this book, the work was misidentified as "The Pursuit--'Woodstock Races'," the author referring to it with the same nickname originally given to the now-lost The Charge of Custer at Winchester. The confusion stems from a facetious reference to the hasty retreat of Confederate cavalry to the town of Woodstock after the Battle of Tom's Brook, during the same general engagement. The Pursuit was not originally referred to as "The Woodstock Races" in Trego's time. The painting is reproduced in Ron Field, Confederate Cavalryman vs. Union Cavalryman: Eastern Theater 1861-1865 (Osprey Publishing Company, 2015), p. 73. Here, the painting is also referred to as "The Woodstock Races." Catalogue of the Exhibit of the state of Pennsylvania, and of Pennsylvanians at the Worlds Columbian Exposition, 1893.